Good morning everyone, and a fantastic Mardi Gras to you all! My employer graciously gives us all the day off for Fat Tuesday, so what better way to celebrate the culmination of Carnival than a little wakey whiskey? For this morning's selection I went over to the Bite and Booze HQ and found a local Louisiana whiskey from Cane Land Distilling in downtown Baton Rouge. Cane Land is a relative newcomer to the Louisiana alcohol scene, having opened their doors on St. Phillip St. in 2017. 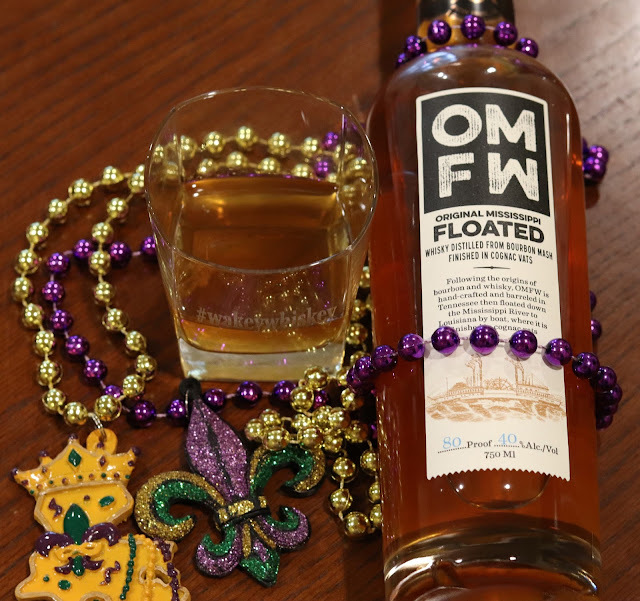 They produce their rum and vodka from their Louisiana sugar cane plantation and mill, making it a true "estate" product that is harvested, mashed, distilled, and bottled all by the same company. Cane Land's whisky on the other hand is not grown locally but instead hails from the historic practice of floating barrels of American whiskey on barges down the rivers of Kentucky and Tennessee into the Mississippi and subsequently South to the ports of Louisiana. Cane Land recreated that process by sourcing Tennessee whiskey at a minimum of 5-years aged and transporting the filled oak barrels by barge all the way down to Louisiana, and then finishing the spirit in cognac vats before being bottled locally. Harking on this process, Cane Land refers to their whiskey as Original Mississippi Floated Whisky. I reached out to Cane Land and their GM John Landry told me that so far they have brought down one barge full containing 150 53 gallon barrels, and they intend on doing it again. They bottle their whisky at 80 proof, or 40% alcohol and it's sold directly out of the tasting room, in local retail outlets, and can be found at several local bars. Enough background, it's time to get into the whisky. The color is in the amber range, darker than straw but not quite getting into copper territory. The aroma is extremely pleasing, a strong oak presence followed up by a fruity sweetness from the cognac finishing. I feel like the cognac really improves the aroma by balancing out the candy corn sweetness typical from a corn mash whiskey. The taste is more of the same, surprisingly smooth, with delicate fruity sweet notes playing well with the more bold oak char flavor of the barrel aging. The alcohol sensation is minimal, and there is a lingering vanilla and cinnamon finish that adds an additional layer of complexity. I think it was a smart move by Cane Land to source their whiskey rather than start out with a young and unpleasant offering. I don't know for sure if they intend to produce their own whiskey mash in the future, but we can only hope that it turns out as tasty as this offering. With that, I hope you all have a fantastic Fat Tuesday, enjoy yourself a #wakeywhiskey of your own, and cheers!